SLT, in collaboration with SL CERT, held the Cyber Security Forum with the aim of increasing awareness and helping CIOs and heads of IT departments in organisations improve online security and prevent cybercrimes. The forum took place at Hilton Colombo Residences with the participation of a large number of CIOs and cyber security and IT security experts in Sri Lanka. Both organisations aim to work together towards the developmental goals of the country, providing assurance for next generation cyber security services. The forum addressed the latest threats being experienced globally, protecting critical national infrastructure and encouraging the administration’s participation in the discussion of national level cyber security initiatives. During the forum, its resource person, Prof. Abhaya Induruwa, said: “Cyber security was previously an issue for the backroom. Now it’s made its way to the boardroom and the situation room. “Cyber threats are growing in intensity and scale. We’ve seen significant breaches at government agencies and in private businesses, including leading global financial institutions and large enterprises. It is important that both the public and private sector should come together in protecting critical assets with confidence and trust, which will help manage risks that are known and get ahead of those not known. The timely collaboration of Sri Lanka Telecom and SL CERT is a commendable effort in this light. At present, the focus should be on two primary areas - the concept of enhanced public/private information sharing and developing standards and crafting a cyber security framework for Sri Lanka that addresses risks across government and industry and to do so quickly. Simultaneously, an effective cyber security framework should enable overcoming barriers in continuing economic growth, while creating an environment that protects and nurtures innovation. The latest unprecedented ransomware attack that has affected organisations in over 150 countries highlights the exploding threat landscape that is faced today. Both the public and private sector as well as economic enablers should take initiatives to secure their digital enterprises from cyber threats. With cybercrimes continuing to escalate, new approaches to digital risks should be assessed and mitigated by any organisation. In his keynote speech, Prof. Induruwa highlighted the importance of building infrastructure in the form of a Centre of Excellence to provide training, education and research in cybercrime forensics and cyber security. He emphasised that the Centre of Excellence must be built on collaboration between law enforcement, academia and the industry, each one of which had to play an important part to achieve success. He added that he was pleased that the Government had recognised the importance of this and had agreed to fund the establishment of the Centre of Excellence, the structure of which he outlined in his presentation. 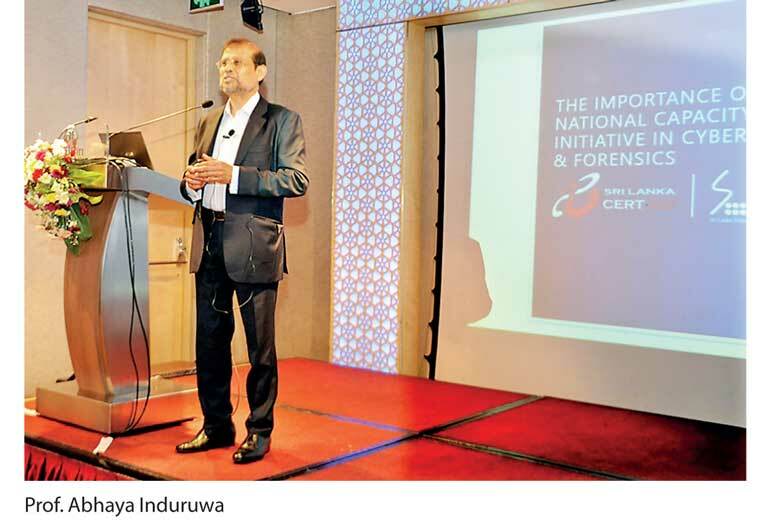 Prof. Induruwa has contributed to Sri Lanka’s ICT industry by pioneering ICT education and playing a pivotal role in the deployment of internet in Sri Lanka. He is the founder of the Department of Computer Science and Engineering at the University of Moratuwa in 1985, the first of its kind at a Sri Lankan state university. In 1989, in a proposal to the Government, he called for the establishment of Lanka Experimental Academic & Research Network (LEARN) to provide data communication throughout the island. Between 1989 and 1995 he served as the prime mover, Principal Investigator and Project Leader of LEARN and deployed the first IP WAN in Sri Lanka in 1993, connecting it to the internet in 1995. Having been appointed to serve on the inaugural Board of Directors of the Computer and Information Technology Council – CINTEC – of Sri Lanka in 1983, a position he held until 1998, he became actively involved by chairing many working committees on data communication, computer networking and computer education, thereby contributing to national IT policy development and implementation. He is also a founding member of the Internet Society formed in Kobe Japan in 1992 and of the Computer Society of Sri Lanka formed in 1976. In recognition of his pioneering efforts in bringing internet to Sri Lanka, Prof. Induruwa was inducted into the Internet Hall of Fame 2014, an honorary lifetime achievement award administered by the Internet Society. Locally, he was honoured by the Internet Society Sri Lanka Chapter with the Internet Pioneers Award at the celebration of 20 years of internet in Sri Lanka in June 2015. He currently serves as the Director of the Centre for Cybercrime and Security Innovation at the Canterbury Christ Church University in the United Kingdom.